There are a large number of non surgical treatments for sunspots and skin cancer. You Dermatologist is an expert in the treatment of sundamage and skin cancer. They can guide you to chose the right treatment for your skin and circumstance. 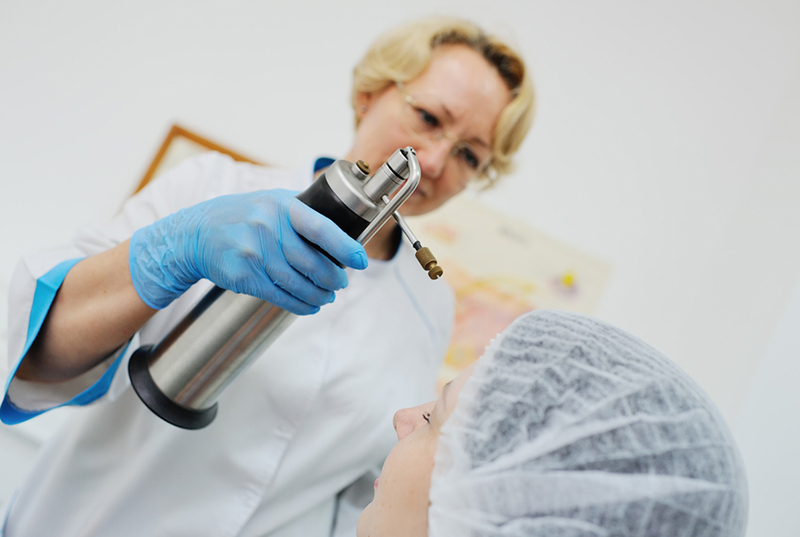 Cryotherapy is a treatment that uses liquid nitrogen sprayed onto lesions to freeze the skin leading to destruction. The liquid nitrogen is used to bring the temperature down to approximately -50 degrees Celsius. Different types of skin lesion require different freeze times to treat. Commonly sun spots are frozen for 5-10 seconds. The treatment is uncomfortable and there is often a blister that occurs at the site. In the past Liquid nitrogen has been used for superficial basal cell carcinoma and bowens disease (intraepidermal carcinoma). The cure rates are lower however for this treatment compared to other forms of treatment. 5-FU is used to treat sunspots and selected superficial intraepidermal carcinoma. This treatment inhibits an enzyme involved in cell reproduction. If cells cannot replicate they perish, thus 5-FU is consider a topical cytotoxic agent (antimetabolite). Sunspots and skin cancers are lesions with rapidly dividing cells and thus are targets for this treatment. 5-FU is usually used for sunspots and for selected superficial skin cancers. Treatment regimes vary from daily to twice daily and from 2-8 weeks depending on the type of lesion being treated. Photodynamic therapy / PDT is a form of light treatment for areas of solar keratosis (sunspots) and low risk superficial skin cancers. The treatment takes place in the clinic and requires one session for sunspots and two sessions for skin cancers. The treatment region is prepared by light scraping with a curette to remove superfical scale allowing enhanced absorption of cream. A light sensitizing cream is applied to the treatment areas and absorbs into the skin over a period of 3 hours. Abnormal cells will absorb more of the medicated cream hence directing the treatment effect to the lesions. Using an Aktilite lamp the cream is activated with a specific wavelength of light producing a photochemical reaction that preferentially damages and destroys the skin cancer / sunspots. Lamp activation takes 7-10 minutes. The treatment can be irritating to the skin, but a cold fan is used to minimize this. Afterwards a good moisturizer is required with PDT as the skin can dry. Slight irritation can persist like gravel rash but this is self-limiting and usually subsides after a day or two. Daylight PDT is approved by the TGA to treat sunspots on the face and scalp. It is not indicated for skin cancer. A Photosensitising cream (Metvix) is applied to the scalp , face or both. Within 20 minutes of cream application the patient is exposed to daylight staying outside for 2 hoursThis one off treatment results is a mild sunburn like reaction that resolves in approximately 10 days. Daylight PDT is completed onsite at our Stafford Clinic by our Dermatology nurses. Daylight PDT is very well tolerated and clearance rates for sunspots are similar to the traditional PDT treatment. Imiquimod is a topical cream that activates your immune system. It is used to treat sun spots and selected superficial (low risk) skin cancers. Regimes for superficial basal cell carcinoma are 6 weeks in duration. The treatment causes a localised inflammatory reaction ie redness, scale and discomfort are common. There are a number of issues to consider when prescribing imiquimod and your Dermatologist can advise you regarding this option. This topical medication causes a localised inflammatory reaction leading to clearance of abnormal cells. The gel is applied for 3 consecutive on the face and for 2 consecutive days on the body. The reaction is strong but lasts a relative short period of time (7-10 days). A small number of patients may have severe reactions to this treatment and your Dermatologist will monitor and can manage this should it occur.